With the Olympic Mountains providing a stunning backdrop, a Washington ferry slides across Puget Sound on a shimmering sea of glass. It’s hard to find an image that better represents the natural splendor of Washington state. Few pictures are more evocative or more picturesque. From a business perspective, though, Washington State Ferries (WSF) is an unsightly mess. The 23 vessels in the state’s ferry fleet carry about 23 million passengers a year and lose millions of dollars doing so. In the biennium that ended June 30, 2011, the system’s revenues from passenger fares totaled $294.5 million; operating expenses were $450 million. That $155 million deficit doesn’t take into account the high capital costs of replacing ferries and terminals. Washington State Department of Transportation (WSDOT) Secretary Paula Hammond warned last winter that without a new infusion of cash, the ferry system would have to shut down six of the 11 routes the system now serves: Port Townsend-Coupeville, Seattle-Bremerton, Fauntleroy-Southworth, Vashon-Southworth, Point Defiance-Tahlequah and Anacortes-Sidney. The ferry system, which is part of the state highway system, covered its most recent deficit by drawing from other public revenues—largely fuel taxes—and the Legislature is likely to pass a measure that will keep the ferries sputtering along for another year. But the long-term picture is grim. With greater competition for shrinking state resources, the ferry system can no longer depend on these revenues to cover its dramatically exposed flanks. In the search for explanations of the ferry system’s fiscal woes, some observers argue that ferry workers are overpaid. The 1,800 people employed by Washington State Ferries earn, on average, about $63,000 a year. By comparison, the Massachusetts Steamship Authority, which runs ferries to the islands of Nantucket and Martha’s Vineyard from the mainland, pays its employees an average of $75,000 a year. An ordinary seaman makes $15 an hour at Washington State Ferries, and more than $20 an hour in the Massachusetts system. A 2010 study commissioned by Governor Chris Gregoire found that the Washington State Ferries pay scale was “fairly consistent … with marine industry norms” and that the ratio of the number of passengers carried to both operating budget and number of employees “is comparable to the other systems.” Management “by all objective measures is doing a good job,” the study concluded. Ironically, the report was being prepared around the same time that an extensive, award-winning “Waste on the Water” investigation by Seattle’s KING-TV uncovered “millions of dollars in questionable spending and virtually no internal review or accountability” within Washington State Ferries, forcing Gregoire and Hammond to call for reforms. Last June, the governor signed into law a bill that eliminates or limits special perks that state ferry workers had enjoyed for years. It also instituted a 25-cent surcharge per passenger to create a fund to finance replacement of old vessels. Capital costs, including replacement of aging ferries, eat up about $125 million a year, and the amount paid for each ferry in the Washington system is likely bloated by a state law that requires ferries to be built in Washington state. That requirement not only reduces competitive bidding among shipbuilders, which might bring down the price, but it also renders the system ineligible for federal grants to help defray expenses. The recently launched Kennewick, Chetzemoka and Salish, for example, cost $70 million each. In 2007, the Massachusetts system paid less than half that amount for a vessel comparable in design, but built in Mississippi. The 2010 study commissioned by the governor recommended that the state open the ferry-construction business to all American shipbuilders, but even if the state allowed WSF to build its ferries elsewhere, its deficits would still be high. Ultimately, the system needs to raise more revenues through state subsidies and/or higher fares. The WSF spends about $10 to transport each passenger. Passengers, on average, pay just $6.60 each. 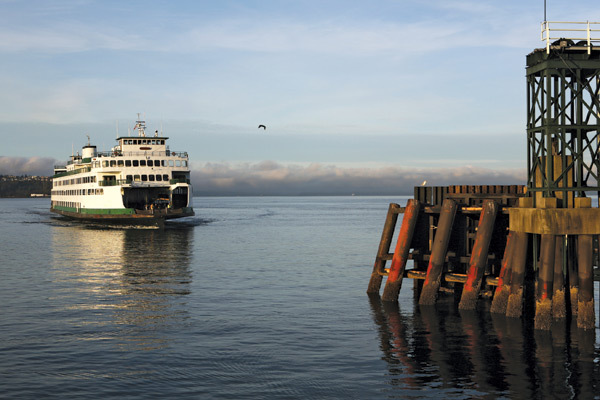 The amount of the subsidy varies considerably, with the heavily used Seattle-Bainbridge service essentially breaking even while fares on the Port Townsend-Whidbey Island route cover less than 38 percent of costs. Services to Vashon Island and the San Juan Islands pay for less than half of their actual operating costs, with total subsidies amounting to $1,610 per island resident annually. To cover the operating budget, ferry fares would have to be increased, on average, by about 70 percent. That calculation includes an assumption that the higher fares would result in a 23 percent decline in passenger traffic. Fares would at least have to double if they were also to defray capital costs. Ridiculous? Think again. The Massachusetts ferry system, which operates independently of the state’s Department of Transportation, covers all its costs from fares, including a replacement fund for new boats. While the Washington system charges $23 to $25.50 for a car and driver going from Seattle to Bainbridge Island and back, in Massachusetts drivers pay $85 to $105 round-trip for a slightly shorter route between Woods Hole and Martha’s Vineyard. Walk-on passengers in Washington pay $7.50 on the Bainbridge run, while in Massachusetts, they pay $16 for a comparable trip. The Massachusetts model might be a lesson for Washington: Charge far higher rates to drivers to encourage them to leave their cars behind and offer better bus connections to pedestrians at either end of the ferry trip. Charging such high fares has worked in Massachusetts, but would it work here? “It would be devastating to Vashon,” says Deborah Richards, executive director of the Vashon Island Chamber of Commerce. “It would make it virtually impossible to live here and hold a job in Seattle or Tacoma.” With fewer commuters, residential real estate values would plunge. Richards thinks there must be a compromise: “We could find a way where the citizens would support it from taxes or tolls,” she says, reflecting a common sentiment in ferry-dependent communities. Lower-cost foot ferries offer another possible solution. The Rich Passage I, which Kitsap Transit will soon be testing, would be more economical than WSF’s Seattle-Bremerton service, but it would still need to be subsidized because fares would cover only about a quarter of the costs. Motorists would, of course, be left high and dry. Another challenge: WSF recently brought out a plan to rebuild Seattle’s Colman Dock—minus the foot-ferry berth it now offers. Another idea would be to charge a toll on the I-90 bridge across Lake Washington, placing it under the umbrella of the Washington Toll Bridge Authority to generate revenue for the ferry system. The Delaware-based Cape May-Lewes ferry operated by the Delaware River and Bay Authority (DRBA) takes such an approach. The system, which connects New Jersey’s southernmost tip with Lewes, Delaware, covers about 68 percent of its operating costs with fares—very close to WSF’s figure. The round-trip charges for the route are $60 for a car and driver and $14 for a pedestrian, roughly twice the fares of a comparable Puget Sound route’s fares. Tolls on an eight-lane turnpike bridge across the Delaware River 60 miles to the north cover the operating deficit and all capital needs. The DRBA constitutes the administrative umbrella for both the bridge and ferry, with the bridge serving as guarantor of the ferry’s solvency. If new sources of revenue aren’t found and Hammond is forced to follow through on her threat of cutting routes, the ferry system would lose about 40 percent of its sailings, according to ferries chief David Moseley. The system would idle about a third of its fleet and shutter six terminals. Road congestion and automobile emissions would rise, and convenience for many people crossing Puget Sound would be a fond memory. For example, a motorist in Southworth, on the Kitsap Peninsula, would have to drive to Bainbridge Island, cross to Seattle on the ferry, then slog through Seattle traffic to Fauntleroy in West Seattle to catch a ferry back to Vashon Island, even though Southworth is only two miles across the water from the Vashon ferry terminal. A driver heading from Port Townsend to Oak Harbor on Whidbey Island—which is normally a one-hour trip that includes a six-mile ferry crossing—would have to drive 35 miles to Kingston, take a ferry to Edmonds, drive 13 miles to Mukilteo, take a ferry to Clinton, and drive 37 miles to Oak Harbor. Not counting ferry wait times, the trip would require more than three hours of driving. Ultimately, Washington can cut the ferry system down to an affordable size or find alternative funding sources, or do a little bit of both. The prospect of the former may ultimately provoke legislators into finding a solution that does more than just keep the system sputtering along. In the current budgetary climate, however, that won’t be easy, which makes it likely that somebody somewhere is eventually going to miss the boat.